Whether capturing your kid’s soccer match or a family celebration, the SanDisk Ultra PLUS SDXC UHS-I cards are great for point-and-shoot cameras and camcorders. The SanDisk Ultra PLUS SDXC UHS-I Card offers a write speed that is faster than ordinary memory cards6 to take better pictures and videos. 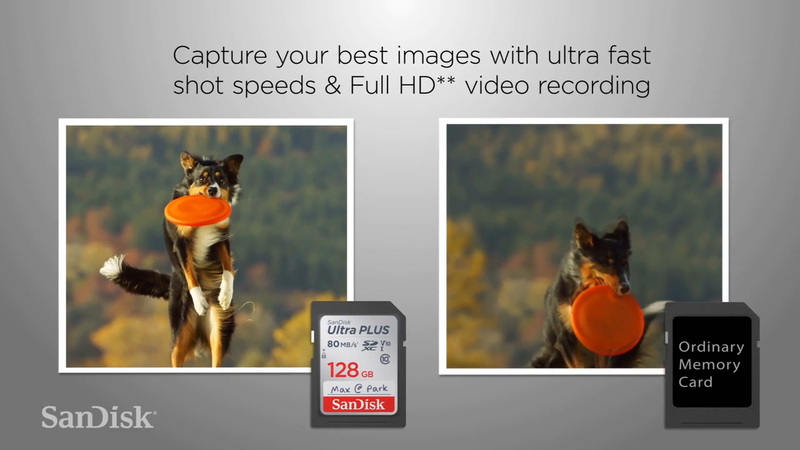 Move pictures and videos to your computer in less time with the SanDisk Ultra PLUS SDXC UHS-I Card or you can even use it as extra storage for your laptop. SanDisk Ultra PLUS SDXC UHS-I Cards are shockproof, temperature-proof, waterproof, X-ray-proof4, so you can enjoy your adventures without worrying about the durability of your memory card. Choosing the right card isn't an exact science. The chart shows example combinations of photographs and videos that you can store on a SanDisk® SD™ card. * 1GB = 1,000,000,000 bytes. Actual user storage less. +Approximations: results will vary based on file size, resolution, compression, bit rate, content, host device, re-loaded files and other factors. Performance my vary based on host device. 1MB=1,000,000 bytes. * Up to 80MB/sec read speed; write speed lower. Based on internal testing; performance may be lower depending on host device. 1MB=1,000,000 bytes. 2 Full HD (1920x1080) video support may vary based upon host device, file attributes, and other factors. See www.sandisk.com/HD. 4 See product packaging and www.sandisk.com/proof for additional information and limitations. 6 Compared to ordinary memory cards up to 5MB/s write speed. 1MB=1000,000 bytes. © 2017 Western Digital Corporation or its affiliates. All rights reserved. SanDisk and SanDisk Ultra are registered trademarks or trademarks of Western Digital Corporation in the US and/or other countries. The SDHC and SDXC marks and logos are trademarks of SD-3C, LLC. All other marks are the property of their respective owners.